They say there is a woman behind every successful man. The quote exactly describes the personal life of Brad Stevens; the head coach of Boston Celtics. He is married to Trace Wilhelmy Stevens and shares two children together. Today, in this particular column, we won't be talking about Boston Celtics' head coach Brad Stevens, instead, we will be digging deep into his married life and relationship with Tracy Wilhelmy Stevens and their children. 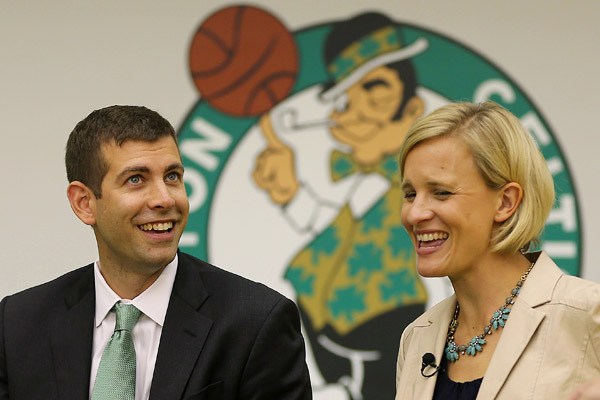 Brad Stevens first met Tracy Wilhelmy Stevens as a freshman at the university. They both attended DePauw University in Greencastle, Indiana. Brad played basketball while Tracy played football in college. The pair hit off due to their love for sports. For the couple’s first date, Brad drove Tracy one and half hours to attend a high school basketball game. It may not have been the most conventional date, but it was perfect for two sports lovers. After graduating college, Brad started working for the pharmaceutical company Eli Lilly. He later quit his job to become the volunteer assistant at Butler University in Indianapolis under Coach Thad Matta in 2000. At that time, Tracy gave him the confidence to accept the job offer. Tracy Wilhelmy Stevens even went back college to study law if in case Brad’s coaching career did not work out. She graduated from Case Western Reserve University School of Law in Cleveland. Tracy would drive five hours to Indianapolis in her jeep to visit Brad while she was studying to be an attorney. It won't be wrong to claim that the distance made them closer. Their dedication to keep the relationship alive during difficult times is a sign of true love. After dating each other for several years, the pair took their relationship to the next level and got married in August 2003. Brad Stevens and Tracy Wilhelmy are now a happily married couple. They have an elder son Brady born in 2006 and a younger daughter Kinsley born in 2009. Tracy left the firm to take care of the household while Brad was focusing on coaching. When Brad was hired by the Celtics, Tracy negotiated the contract for Brad, and became his manager. One of the reasons why Tracy studied law in Cleveland was so she could be closer to her mother who was diagnosed with cancer. Her mother died in 2004. The two have been involved with the American Cancer Society’s Coaches vs. Cancer program partly. Brad believes that being a father is similar to being a coach due to the responsibilities. Brady has developed a passion for basketball just like his father. On the other hand, Kinsley is not very keen on basketball but enjoys spending time with children of the players as well as staffs of her father’s team. The couple loves spending time with their children, and they have a happy family. Brad and Tracy’s love story is one of endurance and endearment.